Before you get cycling it’s best to be prepared in order to make riding more fun and easy. 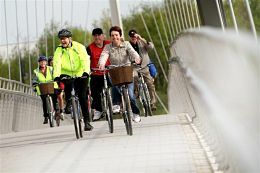 About half the adults in the UK have access to a bike but 75 per cent of women and 53 per cent of men never cycle anywhere, according to the cycling charity Sustrans. This website aims to change that! In this section we’ll cover how to choose the right bike for you; whether you want to ride to work or school, challenge Lance Armstrong in the Tour de France, or ride over the Himalayas! Being comfortable while you’re riding is really important. We’ll guide you through what to wear, from wet weather clothing, to reflectives to make you visible to other road users. We’ll also show you the accessories to make riding both safer and more fun including how to fit a helmet and choosing and fitting lights.